A mother and her lover have been jailed for killing her eight-year-old daughter in east London. Ayesha Ali was found dead in her bedroom with more than 50 injuries including bite-marks, in August 2013. At the Old Bailey, the girl's mother, Polly Chowdhury, 35, was sentenced to 13 years in prison for manslaughter. Jailing her lover and co-defendant, Kiki Muddar, 43, for 18-years for the same crime, the judge described her as a "manipulative, wicked woman". Judge Christopher Moss QC told the court Ayesha's mother had "disgracefully failed" in her role, to keep her daughter safe. During the trial, the court heard Muddar made Chowdhury believe her daughter was "evil" by creating a fantasy world full of characters on social media who told her Ayesha needed to be punished. One alias Muddar created was spirit guide "Skyman", whom she used to manipulate Chowdhury into believing Ayesha had "bad blood" and needed to be disciplined to rid her of "evil spirits". The court heard that Muddar's campaign was played out through 100,000 texts, social media messages and interactions. 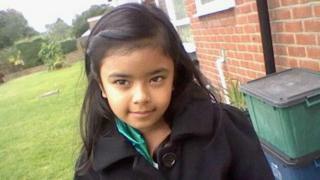 The abuse came to a head on 28 August 2013, when Ayesha was killed at the family home in Chadwell Heath. Chowdhury told the court Ayesha was hurt while Muddar was giving her a cold bath as punishment for wetting herself. On the morning of 29 August, Muddar called 999 to report Chowdhury had tried to kill herself and that Ayesha was dead. Paramedics who discovered the child "cold and stiff", told the jury Muddar reacted dismissively to the dead girl and told them "she was a naughty child and mum thought she was possessed by the devil". A post-mortem examination revealed the girl died from a blow or blows to the head which Judge Moss said could have been caused by contact with the bath rim or inflicted by Chowdhury or Muddar. Judge Moss said Ayesha was subjected to a "life of cruelty and misery that defies belief" in the months before her death. The court heard Ayesha was regularly beaten with wooden spoons, made to perform household chores such as repeatedly cleaning the bathroom, made to go without food or forced to eat too much for misdemeanours set out by Muddar. During sentencing, Judge Moss said he believed Muddar bore the "lion's share of responsibility", after a psychiatrist found she had not been delusional in her actions. He said: "I take account of your personality disorder as mentioned in the psychiatric evidence in this trial, however, in my judgment, you knew perfectly well what you were doing and did it deliberately." During sentencing, the judge also paid tribute to the "courage and personal restraint" of Ayesha's father Afsar Ali, who had to learn the disturbing details of how his daughter died as the case unfolded. Following the verdicts, Mr Ali said: "This has been the hardest and most difficult thing that I have ever had to do in my life. "I lost a battle I never agreed to fight. I cry every night; each teardrop engraves yet another scar." In mitigation, Chowdhury's lawyer, Ali Bajwa QC, said Muddar "skilfully and mercilessly" seized upon Chowdhury's weakness and "excessively gullible and trusting character". "She was brainwashed entirely", he said. Muddar, of Green Lane, Ilford, and Chowdhury, of Broomfield Road, Chadwell Heath, had both denied murder, manslaughter and causing or allowing the death of a child.